Reference number for this case: 8-oct-54-Saint-Etienne-sous-Barbuise. Thank you for including this reference number in any correspondence with me regarding this case. To tell the truth one started to worry. The Aube, which had made a few times ago its own crisis of anti-windshield-breakup as all respectable departments, had not known yet the landing of a flying saucer or an unspecified mysterious machine coming from beyond. It was not natural, when on all sides flying saucers, cigars, barrels and hairy Martians are reported. That was enough to start an inferiority complex. "One saw shiny machines on the side of Arcis". And then information became more precise: It is on the railway near the railway crossing located at the exit of Saint-Etienne-under-Barbuise, on the road which leads to Arcis that two men, of St-Etienne, the father and the son, leaving their work, saw three mysterious machines one week ago already. But of fear of being laughed at, they did not say anything... or almost didn't, and it is slowly that the news of the event perspired. Initially within the Gerbaud sawmill where they work, then in Arcis, finally in the region. And we went to see them yesterday on their workplace. We found Misters Marcel and Jacques Guyot, in the middle of a heap of boards and they agreed, for our readers, to entrust to us what they had seen. They did it in all simplicity. "Well, Sir, here it is! It was one evening, like every evening, I returned from work riding my bicycle and I hurried to cross the railway crossing before the arrival of the Micheline. It was about 07:25. Suddenly, what did I see: three "things" which shone, but shone, white like snow, I tell you. This seemed odd to me, it did not move. It was large "as this" (Mr. Guyot raises the hand at the height of his face). A normal size in a way... "They" were within 150 meters of the railway crossing. "What can I tell you. That is what I saw and nothing different. I did not say anything on the blow because I thought that people were going to laugh, and then, when reading in the newspapers that this happens everywhere, I told it to my buddies. And then, now you know it. This spread quickly!" "I arrived there ten minutes after my father, at the railway crossing, and not very far, within 50 meters ("they" must have had advanced) I saw three of "things" which shone. It was white a bit yellowish. There was one that was and two elongated. I had never seen such a thing. I said to myself: that must be a saucer. I saw them smaller than my father. It changes quickly. "That's all we can tell you". "Be sure, Sir, that if that happens again I'll tell you. Moreover, the next time, I will stay put in the small wood there behind Mrs. Chepy's house, she's the gate-keeper. From there, I could watch and see well. Misters Guyot, father and son, do not agree completely on the height of the mysterious seen machines. They show us how they saw "them". Let our readers not be mistaken. The barrel which is seen on the left is not a flying barrel. TROYES, October 8 ("France-soir" news brief). Would the Martians consider that the railways of our country constitute for their mysterious craft an ideal landing strip? One might think so. For it is again on the railway tracks, in Saint-Etienne-sous-Barbuise (Aube) that Marcel Guyot, 45, and his son Jacques, 21, said they saw yesterday a saucer and two flying cigars. "It was about 7:30 p.m. and I was riding my bicycle home, said Mr. Marcel Guyot, when, when passing the railway crossing that cuts the road to Arcis-sur-Aube, I suddenly saw, lying on the railway, three machines that emitted a violent white light. Surprised, at the time, I continued my way, and it was a little later that I understood that it was flying saucers, but I did not dare to go back. "One of the machines," he said, "was round like a saucer, while the other two were elongated like cigars. The news made a sensation in the Aube, for it is the first time that such machines have trodden the ground of the department. And, gosh! People were beginning to worry. Aimé Michel indicates that on October 7, 1954, at 07:30 P.M., in Saint-Etienne-sous-Barbuise three machines landed on a railway track. In addition, in an article published in the scientific magazine of popular science, "Science et Vie", Aimé Michel indicates that on October 7, 1954 in St Etienne-sous-Barbuise in the Aube, there was an observation of three objects releasing a violent white light. One was in the shape of disc, the two others were elongated like cigars. The author indicates that on October 7, 1954, in the evening, Marcel Guyot was returning from work close to Saint-Etienne-Sous-Barbuise in the department of Aube and his son Jacques son took the same road, ten minutes afterwards. Both saw, at a railway crossing, three objects which emitted a shining white light. Jacques Guyot confirmed the observation of his father, adding that the three objects were always on the road when he had seen them. One was circular, the others in the shape of cigar. 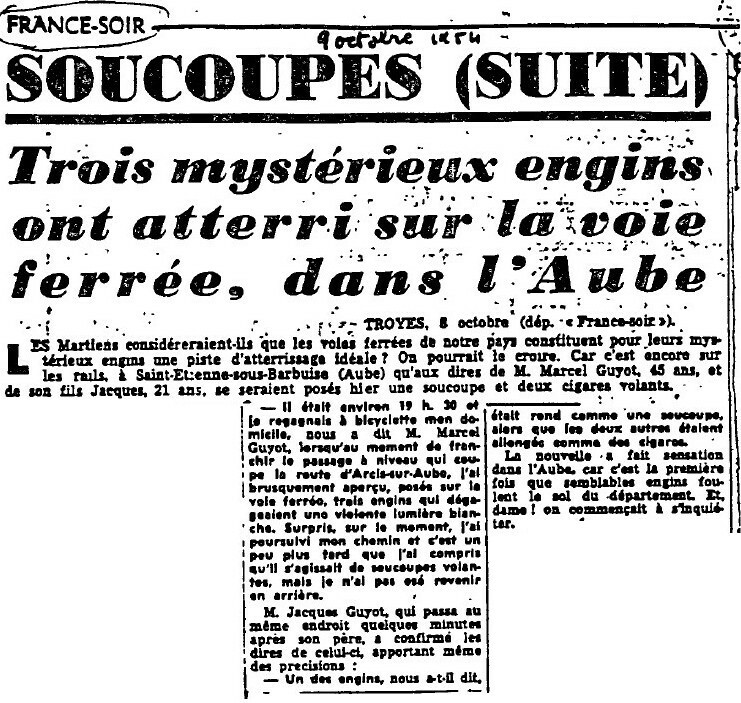 The two ufologists and authors give their report of an observation in Saint-Etienne-sous-Barbusse in the Aube, on October 7, 1954 at 07:30 P.M., from personal file and newspaper clippings. They note that the ufology magazine "Lumières dans la Nuit" published a very good investigation in its January 1975 issue. They point out that this was one of the very rare cases in which three UFOS were seen together on the ground, citing another such case in France, that of Englefontaine on August 2, 1974. The indicate that the encounter occurred to two farmers of Saint-Etienne-sous-Barbusse, Mr. Marcel Guyot and his son Jacques, whereas they returned from their work, separately, with the father preceding his son by a few minutes, both taking however the same way. Both, when they went across a railway crossing, saw the same strange show: at a few tens of meters, three objects which were posed on the railway, emitting a white light, very shiny. Marcel Guyot describes them as being discs, his son as being cigars, which the authors indicates being a change of aspect which recalls much of the testimony of Mrs. Leclercq in Cousolre. They point out that neither Marcel Guyot nor his son sought to see more of that, both impressed by what they saw they, had regained their house as fast as possible. Oct. 07, 1954, 07:30 P.M., St. Etienne-sous-Barbuise (France). Marcel Guyot was coming from work near this village, and his son Jacques followed the same road 10 min later. Both saw, at a railroad crossing, three objects on the ground that gave a bright white light. One was circular, the others cigar-shaped. (42; M 146) (France-Soir, 9 Oct. 1954). 70. Oct. 7. In the evening, M. Marcel Guyot was coming from work near Saint-Etienne-sous-Barbuise (Aube) and his son Jacques was following the same road, ten minutes behind. Both of them saw, at a railroad crossing, three objects which gave off a bright white light. Jacques Guyot confirmed his father's observation, adding that the three objects were still on the tracks when he saw them. One was circular, the others cigar-shaped. October 7, 1954, 07:30 p.m. St-Etienne-sous-Barbuise (Aube). Marcel Guyot was returning from his work on the outskirts of the village. His son Jacques followed the same route ten minutes later. Both saw at a railway crossing, three objects on the ground that produced a bright white light. One of them is circular and the other had the shape of a cigar. "Saint-Etienne-sous-Barbuise - 10 - 07:30 p.m.: no investigation. Hoax." Three objects were seen posed on a railway by Marcel Guyot and his son. Marcel Guyot sees at the railway crossing of Arcis-sur-Aube three apparatuses on the ground. His son passed at the same place a few minutes later and also saw it, stating that one looked like a saucer and the other two were cigar-shaped. The authors say that in reality, they had seen three painters from Arcis-sur-Aube returning to St-Etienne-sous-Barbuise pushing their bikes on the track, to avoid getting fined by the police as they had no light. When they arrived at the village bar, they told that in their place people could have taken these three painters for Martians. The local newspaper correspondent who was also at the bar with ears wide open phoned to his editor the unbelievable story that was widely reported in the Press. If we can believe the story, three UFOs set down on the gTound near a rail crossing at St.-Etienne-Sous-Barbuise. Glowing brightly, one round object and two cigar-shaped objects, had parked themselves at the spot for some un known reason. M. Marcel Guyet passed that way after work and saw the objects, as did his son who travelled the same road a short time later. 77. 77. France-Soir. 10 October 54. Jean Sider indicates that on October 1 or 2, 1954, in the Aube, at the crossing of the railway line at the exit of St. Etienne-sous-Barbuise on the Arcis-sur-Aube road, two workers saw an unusual sight: first, Marcel Guyot saw on the railway at 07:25 p.m. three "things" shining white as snow and not moving, about 1.60 m tall and at a distance of about 150m. Ten minutes later, his son Jacques saw the same scene, but closer, at about 50 m. The "things" shone yellowish-white. The son found them smaller than the father. The witnesses did not say anything right away for fear of ridicule, but an indiscretion on their part gave rise to a rumor that spread and finally reached two journalists who published an article after meeting the Guyots, accompanied by a photo of the witnesses. Fifteen days later, another text appeared in the same newspaper reporting a rumor circulating in the country, saying that the Guyot had been abused by three painters who were walking along the railway track while pushing their bikes because they had no lighting and were afraid of being fined by the police if they had taken the usual road. Jean Sider says his sources are Est Eclair, of Troyes, October 8, p. 4 and October 25, 1954, p. 3. He added that as the case might be a CE3, he will mention it again further in his book. First the three painters without lighting that shine and do not move, and seen in the same place at a ten-minute interval, "it's not serious." Then, it is the same newspaper which suggested 15 days later that there was a confusion from the reflection of a painter who uses the conditional, and it would be a joke made by someone familiar with the testimony of the Guyots. The first note would eliminate the confusion, the second would demonstrates that it was not a journalistic abuse but nothing more than an error from the correspondent of Est Eclair, who had taken the joke of the painter for serious information. He adds that in July 1989, researcher Roger Chéreau met the Guyots. The father was senile and longer able to speak, and the son "probably suffered a mental block" as he did not want to cooperate; yet he did not confirm the confusion and journalistic abuse. R. Chéreau found that the railroad where the phenomenon had been observed is curved there, and that if they were painters, they could not have been seen ten minutes long. Jean Sider adds that ridiculed by those around them at the time, the two ulcerated men preferred to remain silent. Jean Sider says further in his book that on October 1 or 2, 1954, at 07:25 p.m. in Saint-Etienne-sous-Barbuise in the Aube, MM. Guyot father and son, about ten minutes apart, saw three separate brilliant phenomena without details discerned, lying on a railway track, near a crossing. One was round, the other two "elongated" and we are not told whether vertical or horizontal, so, if they were vertical, one may think they were UFO occupants, according to Jean Sider. He indicates that it comes from a local source, Est Eclair, of Troyes, for October 8, 1954, and gives a xerox of the article. He adds that Michel Figuet, on pages 665-666, has found it sensible to offer two different versions to reduce the case, first a confusion with painters who were walking home, pushing their bikes along the railway, then a farfetched story invented by a journalist in search of glory. Jean Sider recalls that in Chapter 3, case 6, he explained why the two versions in no way corresponded to the facts when they are scrutinized, but he offers this potential CE3 with "reservations", "because it is not obvious." The Belgian ufologist indicates that on October 7, 1954, in St Etienne sous Barbuise, "Marcel Guyot came back at 19:30 from his work in the periphery of this village. His son (Jacques) followed the same road ten minutes later. Both saw, at a level crossing, three objects on the ground, which produced a brilliant white light. One of them was circular, the other had the shape of a cigar (note by vog: what about the third?" She indicates that the sources are "France-Soir, 9 oct 1954" and "Jacques Vallée: 'Chronique des apparitions ET' - DENOEL 1972 - J'AI LU COLL. - p. 271". She adds that in reality: "the local correspondent of 'Samedi Soir' seeking for the sensational and who was at the coffee shop where a story was told, phoned the incredible story to his editor, it was widely published in the press." She indicates that the source of the above is "M. FIGUET/ J.L. RUCHON: 'Ovni, Premier dossier complet...' Alain Lefeuvre pub. 1979, p. 665, 666".
! 1954/10/07 St. ETIENNE-sous-BARBOUSE, FR: 3 painters seen as Martians. 1954 - Marcel Guyot was coming home from work at 7:30 p.m. near the village of St.-Etienne-sous-Barbuise, France, and his son Jacques followed the same road 10 minutes later. Both saw three objects on the ground at a railroad crossing that gave off a bright white light. One was circular, the other two were cigar-shaped. (Sources: Aime Michel, Flying Saucers and the Straight Line Mystery, p. 146; Jacques Vallee, Passport to Magonia, p. 220). 07:30 p.m. Marcel Guyot was returning from his work on the outskirts of the village. His son Jacques followed the same route 10 minutes later. All the 2 saw at a railway crossing, three objects on the ground that producced [sic] a bright white light. One of them was circular, the other was shaped like a cigar. Jérôme Beau indicates that his source is "France-Soir, October 9, 1954". Luc Chastan indicates that in the Aube in St Etienne sous Barbuise on October 7, 1954, at 19:30 hours, "Observation of three objects releasing a violent white light. One in the shape of a disc, the two others was lengthened like cigars. They were posed on a railroad track." Luc Chastan indicates that the source is "M.O.C. par Michel Aimé ** Arthaud 1958" et "Science et vie". The website indicates that on 7 October 1954 19:30 St. Etienne-sous-Barbuise, France, "Marcel Guyot was coming from work near this village, and his son Jacques followed the same road ten minutes later. Both saw, at a railroad crossing, three objects on the ground that gave a bright white light. One was circular object, the others cigar-shaped." The website adds: "An object was observed. Electromagnetic effects were noted. One changing color cigar-shaped object was observed by one male witness on a highway for a few seconds (Lefebure; Tremblay)." The sources are noted as Guieu, Jimmy, Flying Saucers Come from Another World, Citadel, New York, 1956; Michel, Aime, Flying Saucers and the Straight-Line Mystery, S. G. Phillips, New York, 1958; Poher, Claude, Etudes Statistiques Portant sur 1000 Temoignag, Author, undated; Bowen, Charles, The Humanoids: FSR Special Edition No. 1, FSR, London, 1966; Vallee, Jacques, Computerized Catalog (N = 3073); Vallee, Jacques, Challenge to Science: The UFO Enigma, Henry Regnery, Chicago, 1966; Vallee, Jacques, Preliminary Catalog (N = 500), (in JVallee01); Vallee, Jacques, A Century of Landings (N = 923), (in JVallee04), Chicago, 1969; Schoenherr, Luis, Computerized Catalog (N = 3173); Carrouges, Michel, Les Apparitions de Martiens, Fayard, Paris, 1963; Hall, Richard H., The UFO Evidence, NICAP, Washington, 1964; Rodeghier, Mark, UFO Reports Involving Vehicle Interference, CUFOS, Chicago, 1981; Falla, Geoffrey, Vehicle Interference Project, BUFORA, London, 1979; Hatch, Larry, *U* computer database, Author, Redwood City, 2002. *Oct. 7, 1954 - Marcel Guyot was coming home from work at 7:30 p.m. near the village of St.-Etienne-sous-Barbuise, France, and his son Jacques followed the same road 10 minutes later. Both saw three objects on the ground at a railroad crossing that gave off a bright white light. One was circular, the other two were cigar-shaped. (Sources: Aime Michel, Flying Saucers and the Straight Line Mystery, p. 146; Jacques Vallee, Passport to Magonia: A Century of Landings, p. 220, case # 209). A first point is the date. With the exception of Jean Sider [js1], all sources have a false date. The newspaper was published on October 8 and specified that it had happened a week earlier. This does not give a specific date, but October 7 is thus an impossible date. A second point is the idea that it would have been invented by a reporter from France-Soir: it is obviously impossible since France-Soir appeared with the story on October 9 while the affair was already in the regional newspaper on October 8; therefore it cannot be an "invention" of a "France-Soir correspondent", even if such a correspondent was really looking for a sensation article. Very likely a France-Soit correspondent simply reported to his Parisian newsroom what he read in the article published in the regional newspaper, France-Soir printing it the next day, as it was usually done. A third point is that this time - this is not always the case but it happens a number of times - Barthel and Brucker seem to have invented the "hoax" explanation: there is no information about it; and there is this explanation of painters in white outfits, apparently more established. Unless it is the latter that was the "hoax". In any case, I see nothing to really ensure any explanation for now. The story is extremely sketchy - the Est Eclair journalist does not do a decent job. No clear details, almost no overlap between the father and the son. The father gives no shape, he said only three "things". The son does not say if these were craft, he speaks only of a "round" and two "elongated" - which became a disc and two cigars in Vallée and his copycats. The son who say it was three things concludes that it is a (single) saucer; one wonders if he really knew what the "saucer" expression was supposed to mean. He speaks of a yellowish white where the father said "white as snow"; it does not give the same distance - and it is a bit too easy to claim the "things" must have moved. It may as well be said that the two did not see anything very well, that it was really three painters on bike, that "ten minutes" interval is nothing scientifically established, etc. In short, I think this is a very inconclusive case. [ee1] Article in the regional newspaper L'Est-Eclair, Troyes, France, page 4, October 8, 1954. [---] Article in the national newspaper Paris-Presse, Paris, France, October 9, 1954. [---] Article in the regional newspaper L'Est-Eclair, Troyes, France, page 3, October 25, 1954. [am1] "Mystérieux Objets Célestes", book by Aimé Michel, Seghers publisher, France, pp 199, 202, 1958. [jv3] "The Pattern Behind the UFO Landings", article by Jacques Vallée, in the ufology magazine Flying Saucer Review (FSR), U-K., Special Issue #1, page 13, August 1967. [gl1] "Face Aux Extra-Terrestres", book by Charles Garreau and Raymond Lavier, Delarge publisher, J'ai Lu, France, page 216, 1975. [jv4] "1954: 7 jours, 40 observations" article by Jacques Vallée, in the history magazine Historia, France, special Issue, #46, page 45, 1976. [fr1] "OVNI, Le Premier Dossier Complet des Rencontres Rapprochées en France", book by Michel Figuet and Jean-Louis Ruchon, Alain Lefeuvre publisher, France, pp 665-666, 1979. [---] "Vehicle Interference Project", by Geoffrey Falla, British UFO Research Association (BUFORA), U-K., 1979. [---] "UFO Reports Involving Vehicle Interference", by Mark Rodeghier, Center for UFO Studies (CUFOS), USA, 1981. [js1] "Le Dossier 1954 Et l'Imposture Rationaliste", book by Jean Sider, Ramuel publisher, France, pages 91-92, 180, 1997. 1.0 Patrick Gross May 1, 2009 Conversion from HTML to XHTML Strict. First formal version. Additions [go1], [dj1], [jb1], [lc1]. 1.1 Patrick Gross September 23, 2014 Additions [jv3], [jv4], [js1], [ni1]. Explanations changed, were "Not yet checked; rumour" so far. 1.2 Patrick Gross December 19, 2016 Additions [lg1], [ub1]. 1.3 Patrick Gross January 3, 2017 Addition [fs1].